At his regular post-cabinet press conference the PM began by speaking about the importance for New Zealand of the 15th round of TPP negotiations which have begun in Auckland. 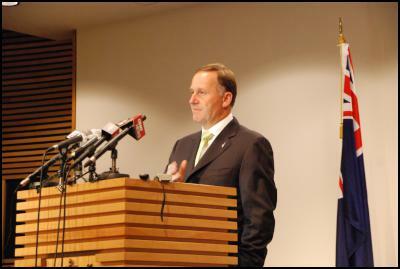 The Prime Minister said that the value of the TPP to the New Zealand economy could be as high as US$2.9. 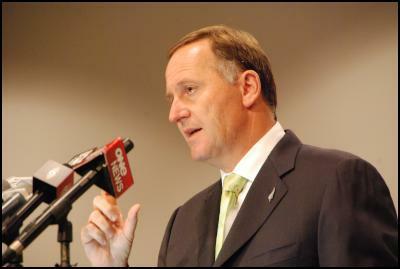 He said that New Zealand wanted to eliminate all tariffs including those on sensitive products. He described it as essential to building a more productive and competitive economy. He said that nearly 50% of New Zealand exports are covered by FTAs and emphasised his position that the country needs to continue its trade involvement in the Asia-Pacific region. The Prime Minister then spoke about the timetable for the public release of the Canterbury Earthquakes Royal Commission report. He said that the government had now received the final parts of the seven volume report and explained how these volumes would be released to the press. He said that the full report was more than 1100 pages long and contains 189 recommendations in total. He said that the government had released the first three volumes in August of this year and accepted all seventy of the recommendations contained in them, saying that some had already been implemented while others were in the process of being addressed. He said that they planned to release the remaining four volumes prior to Christmas. He indicated that they would be releasing the final two volumes without a government response in order for the families of relatives of those affected to be able to read the report as soon as possible. The PM was asked why the David Bain compensation claim was being held up and was asked if there was a problem with any of the recommendations or if the amount of compensation was an issue. He was then asked what legal advice Judith Collins has an issue with and if the PM knew the name of the QC whose legal opinion was being sought. The PM answered that the reasons for the delay were because of the justice minister seeking clarity over certain points and that he did not feel he could comment further on details. He did confirm that the name of the QC was Robert Fisher. The PM was then asked whether the full report would ever be released publically. He responded that he was not sure. The PM was asked why there were two US jets on the tarmac at Wellington airport this week. He responded that some US officials were visiting to have meetings with intelligence officials but he did not know the names of those involved. The PM was pressed further with a round of questions including: Were they CIA? ; How long were they here? ; and: Should it be his business as Minister in charge to know why foreign intelligence services were meeting in New Zealand. On the issue of KiwiRail’s closure of Hillside Engineering, the PM was asked whether he felt it was fair that National was being blamed. He responded that the jobs were purely a matter for KiwiRail. 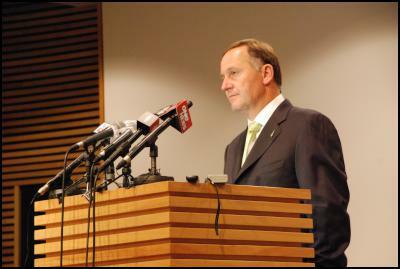 The PM was asked about the comments made by John Tamehere. He responded that he did not wish to dignify the comments but said that it was another indicator of the deep divisions in the Labour party. The PM was then asked whether he felt John Tamehere was a misogynist and whether Mr Key would accept him in the National Party. The PM declined to answer. The PM was then questioned in more detail about the findings of the Commerce Commission interim report and whether he would consider implementing its findings. He emphasised that the government would need to assess the report in much more detail before arriving at recommendations. The PM was asked whether the government would consider intervention in the property market to lower house prices for first time buyers. He responded that the government did not believe in devaluing property prices and that the issue was primarily one for Auckland as a separate market, not one for the nation as a whole. 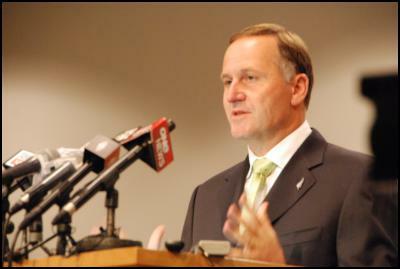 The PM was asked his response to the recent polls which indicated that the Greens and Labour had more support than the National Party. He responded that he expected polls to fluctuate between now and the eventual election and emphasised that he considered the election to be a long way off. On the TPP, the PM was asked whether he would expect New Zealand investment rules to be liberalised in the wake of the negotiations. The PM was asked about progress on the MMP consensus. He responded that “she who seeks consensus is out of the country” and an answer would have to wait. The PM was asked if he had any timetable in mind for the appointment of a Speaker. He responded that if the position became vacant he would look into it. Again on the David Bain compensation claim, the PM was asked if the problem was due to an internal inconsistency in the report. He indicated that this was not a question for him to address. Finally, the PM was asked whether there was a risk that the government would end up spending more on legal advice than they would on compensation.